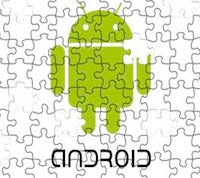 If you are not into those racing or combat games that many mobile users are hooked to these days, then why not try some great puzzle games for Android. Playing challenging games will not only get you through a boring workday but will also give your brain the workout it needs. Reports have suggested that playing challenging puzzle games cuts the risk of diseases like Alzheimer's. As the name suggests, this game tests your memory skills. The rules of the game are simple; you have to turn over pairs of matching cards. You must use your short-term memory to outwit this game. You can spice up the game by switching between 4 different themes (more in the Pro version). With over 1000K downloads so far, Memory is a great time-waster and more importantly, a fun way to improve your memory. Sudoku is a logic-based number-placement puzzle which is completed by filling a 9x9 grid with digits so that each column, each row, and each of the nine 3×3 sub-grids that compose the grid (also called "boxes", "blocks", "regions", or "sub-squares") contains all of the digits from 1 to 9. The game so popular that Sudoku World Championships are held each year. 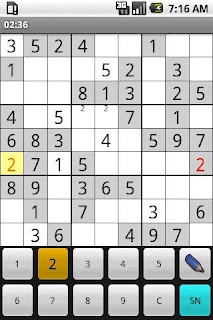 Bringing Sudoku to your little Android device is the open source (and free) application called OpenSudoku. 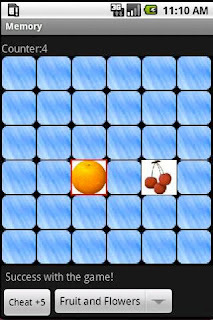 Once installed, you can download puzzles from the web or enter them by hand. The game also records your game time and history, so that you can brag about your ninja sudoku skills to your friends. For the clumsy-fingered masterminds, there are 2 ways to input numbers, either using touchscreen or by a separate numeral pad at the bottom. To change things up a little, you can also switch between different themes. The game’s absolutely free, so go ahead and download it now. Also, don’t forget to thank us if you go on to win the Sudoku World Cup some day. 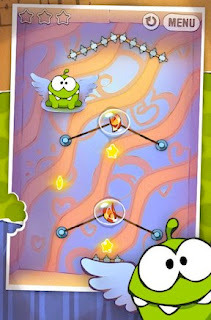 Cut The Rope is a physics-based puzzle game that has won massive critical acclaim worldwide. This BAFTA-winning game is one of the most popular puzzle games around. All you have to do is to feed the hungry little monster Om Nom by cutting ropes that hold the candy he wants. To release bundles of sweets into his mouth, just swipe your fingers across the screen. The other objective is to pick up to 3 stars per level by touching them with candy. With more than 40 million players worldwide, Cut The Rope is a definite must-have game for your Android. Word Feud is a cross-platform multiplayer word game wherein you challenge friends and random opponents to play up to 30 separate games simultaneously. 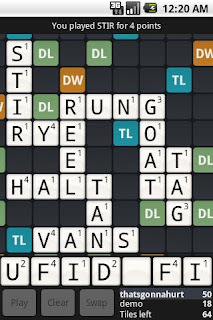 The game features a 15x15 tile board where you place the right words on the right tiles to score high points. While playing the game with a friend, you can also chat with him or her, making the game even more fun. Word Feud has over 3 million players worldwide (iPhone and Android combined) and has a 4 and ½ star rating on the App Market. N.B: This is an online game and you need to register for a free account to play it. Also, make sure you have a good Internet connection so that your feuds will never be interrupted. 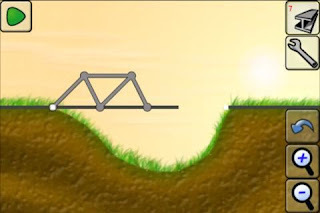 X Construction is a simple physics-based puzzle game that involves building a bridge so that a train can safely cross a valley. Folks who’ve played World of Goo will find it quite familiar. X Construction has about 21 levels in the full version and has been installed more than 100K times. The full version is not free but you can always try the lite version. This is a fun puzzle game wherein you start as a moron (yes, you heard me right fellas). 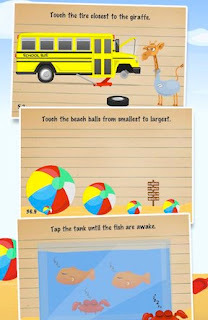 By solving tricky puzzles and challenges, you advance from a moron to a proud genius. The Moron Test presents challenges where you use your brain to advance through various levels each of which are extremely fun. The game is well designed, with characters and environments you’ll absolutely adore till the very end. The Moron Test is not free, but considering its huge popularity, it is definitely worth your every penny. O', pretty sure you'll find Cryptica, the new game by Pixibots challenging and fun.